A landing page is a lead capture web page. It has a form that a website visitor has to fill out in order to get a special offer, like a coupon, discount, ebook, video, or some other type of valuable content. The landing page conversion rate is the percentage of people that fill out the form. Here's the most important part: Once a website visitor fills out the form, they get entered into your database and can be followed up on by a salesperson or furthered nurtured until they're ready for a sales call. 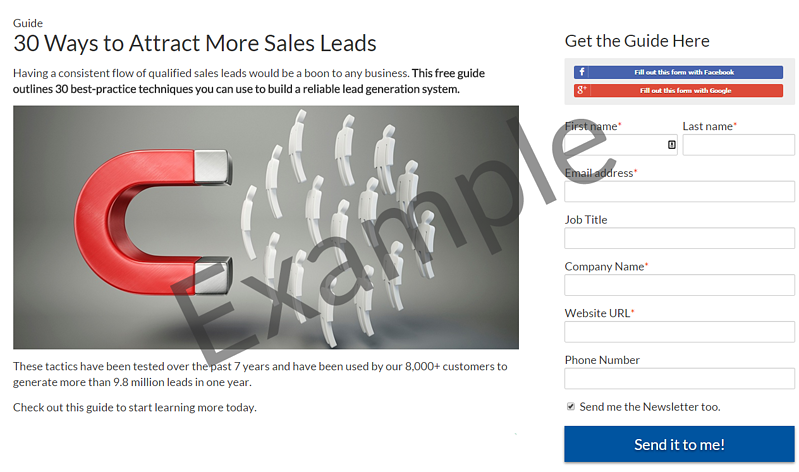 Landing pages are the lifeblood of online lead generation. If my landing page conversion rate was 60%, that means that if 100 people came to this specific web page, 60 of them would fill out the form and "enter my world". Not all landing pages are cut from the same cloth. Some are really good, and some are really bad. If you have a low conversion rate, you need to re-think your offer or how it's presented. Try doing something different to increase the chances of people accepting your offer. If you don't know your conversion rate, then before you do anything else you need to figure out a way to get that information on a regular basis. You need to compare the conversion rates on your landing pages over time so you can keep track of what's working and not working. HubSpot is a great tool to do just that.